The field of Human Resources in China is perpetually expanding in scope and complexity. Technological change has left no aspect of HR untouched – every area has been affected, from talent acquisition and retention to human capital management. 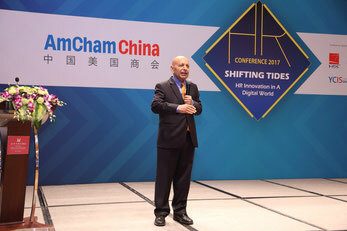 This year’s AmCham China Human Resources Conference was dedicated to promoting HR Innovation in a world of digital transformation. Each year, the AmCham China HR Forum invites corporate Human Resources leaders, executive search and leadership development professionals, technology and service solution providers, and other senior executives to come together and define the best practices in the human resources world. As one of the most successful gatherings over the past 17 years amongst the AmCham China community, the HR Conference has been serving as a key platform for AmCham members and the broader HR community in China to benchmark key trends and cutting-edge innovation in talent acquisition and retention, human capital management and the creation of higher value for business growth in not just the China-based multinational corporations but also small and medium-sized companies and rising Chinese enterprises. The rapid and dramatic effects of technology on human capital, however, does not mean that modern HR professionals lack the tools to handle these new challenges. Within the field, technological innovation has also brought new methods and resources into the reach of the savvy professionals. Our executive search consultants from our Beijing office joined the event.